FIU honors the newly appointed Secretary Acosta; President Trump releases his budget proposal for fiscal 2018; the Greater Miami Chamber of Commerce visits the vice president’s office; and the Latin American and Caribbean Center hosts a discussion on Central American gangs. 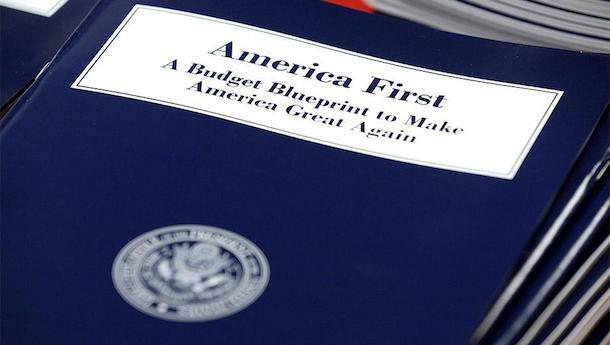 President Donald J. Trump’s budget was released last week. In terms of education, the administration plans to decrease funding by 13.5 percent – from the $68.2 billion in 2017 to the proposed $59 billion in 2018. The president’s budget sustains Pell grant funding, allowing for year-round Pell for an estimated 7.3 million students who currently benefit from the program, maintaining the maximum award at $5,920. At FIU, roughly half of the undergraduate students benefit from annual Pell grants. The administration has also proposed to reduce funding for Federal Work-Study, which 411 FIU students take part in, and eliminate Perkins Loans entirely. Last week, Congresswoman Ileana Ros-Lehtinen, along with other members of Congress, introduced the Perkins Loan Extension Act of 2017 to extend the program for a period of two years; currently, more than 200 FIU students benefit from Perkins Loans. The program is set to expire Sept. 30, 2017. Also of great concern to FIU is the proposed elimination of international education funding that currently supports the Latin American and Caribbean Center at the university. FIU’s Office of Governmental Relations will continue to monitor developments with this year’s budget process. For a full listing of the programs proposed to be eliminated by the Trump administration, click here. 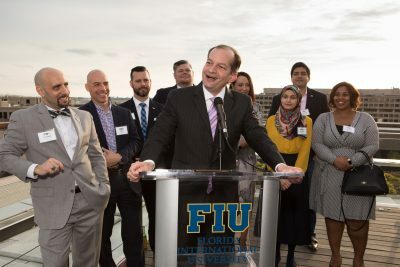 The Honorable R. Alexander Acosta addresses crowd at roof-top reception hosted by FIU in D.C.
On May 22, FIU welcomed Secretary R. Alexander Acosta to Washington, D.C. for a rooftop celebration attended by more than 100 alumni, corporate friends and members of Congress. 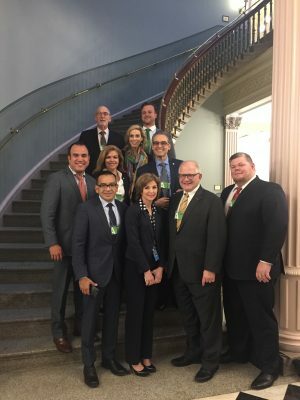 The former dean of the FIU College of Law was honored alongside other top-level White House appointees – including alumni John Barsa ’91, principal deputy assistant secretary and acting assistant secretary of the Office of Partnership and Engagement at the Department of Homeland Security, and Jose Viana ’92, assistant deputy secretary and director for the Office of English Language Acquisition at the Department of Education. Secretary Acosta reflected on his time at FIU and lauded the overall character of the university. “That’s the beauty of places like FIU – they transform individuals and lets them aspire to whatever they think possible,” Acosta said. The celebration, co-sponsored by the Greater Miami Chamber of Commerce and Becker Poliakoff, marks the first time a U.S. cabinet secretary visited FIU in D.C.
Helen Aguirre Ferre, White House Director of Hispanic Media, and President Rosenberg with members of the Greater Miami Chamber of Commerce. Visiting members of the Greater Miami Chamber of Commerce, led by current chairman and FIU President Mark B. Rosenberg, met with members of Congress and the Trump administration, and highlighted priorities imperative to South Florida, including affordable housing, transportation, infrastructure and trade deregulation. On May 23, faculty members from FIU’s Kimberly Green Latin America and Caribbean Center traveled to Washington, D.C. to present their research on MS-13 and the gang phenomenon in El Salvador. The panelists discussed the prevalence of gangs in Central America, the socioeconomic factors that contribute to gang membership and the likelihood for desistance amongst active members. For a full summary report on their findings, click here. The FIU in D.C. alumni network partnered with Hands on D.C. May 22 to improve the physical condition of a local public school. The group of nearly 20 alumni volunteered for several beautification projects at Orr Elementary School, including painting its interior and landscaping the school grounds. Student interns arrive in Washington, D.C. The majority of FIU students interning in the nation’s capital arrived ready to unleash their talents this summer. As of 2013, approximately 50 FIU students make their way to Washington, D.C. each summer to work in government agencies, non-profit organizations and the Washington Center Program. FIU in D.C. encourages all Panthers to come by and take advantage of the collaborative aid and professional support that abounds at FIU’s D.C. offices. Budget cuts of this nature are more sharply felt at the truly “international” university that is FIU. Peripheral programs are designed to solidly benefit the amazingly diverse population of South Florida, providing measurable value for our community, further substantiating the motto “Worlds Ahead”.